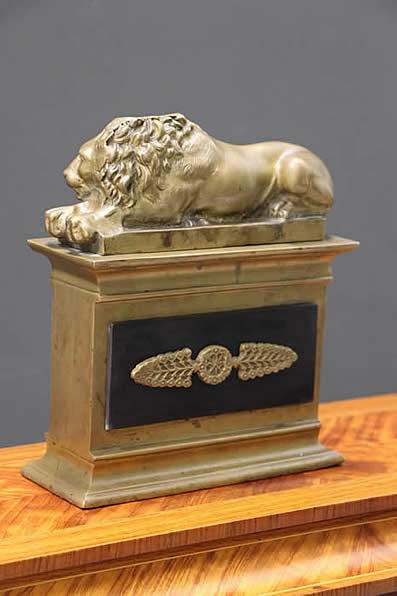 French Empire or Regency heavy solid bronze recumbent lion sculpture. 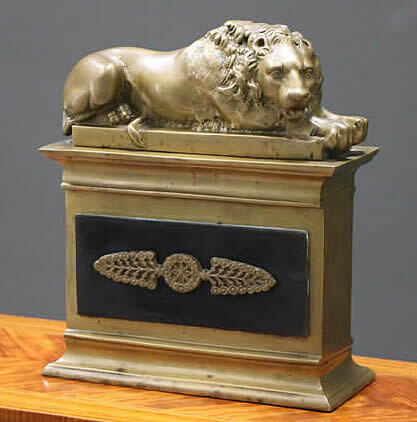 The Lion of Lucerne resting on a plinth mounted to an Empire pedestal with dark patinated panels and Empire highlighted design. This statue finished all round to stand in the centre of table as a desk top ornament or paperweight. Very heavy weight at 4.5 kg ideal as a bookend. 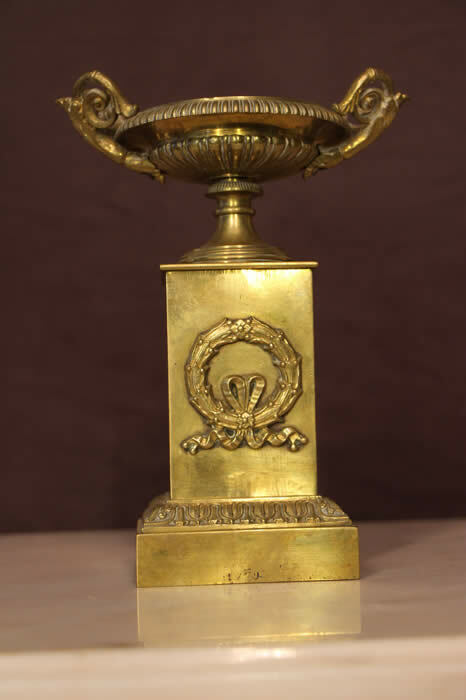 Superb quality antique French Empire period brass or bronze urn in the Napoleonic manner. 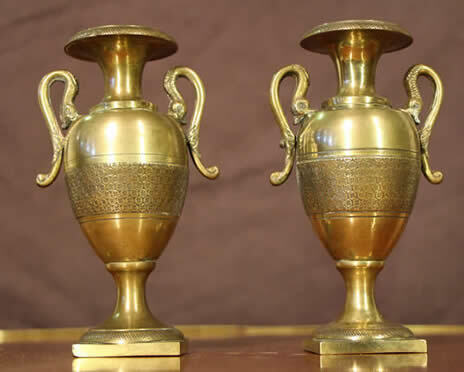 This tall Empire vase or tazza in the shape of a large urn with finely cast and chiseled details and mounted with separately cast acanthus rings. 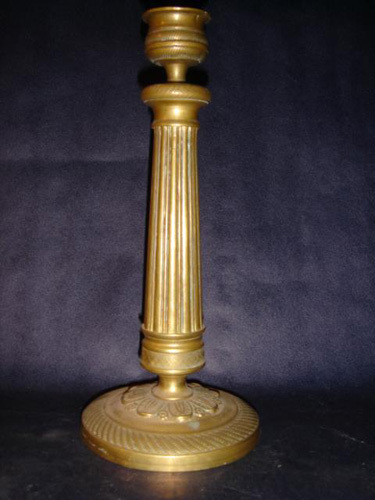 Raised on circular column pedestal and square stepped plinth and mounted four ball feet. 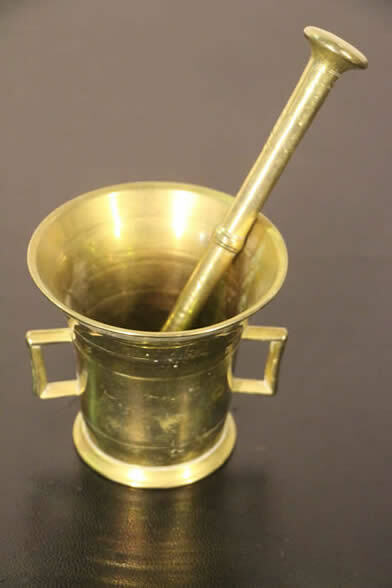 A well polished brass mortar and pestle. the Mortar with cast handles or lugs for heavy duty crushing . 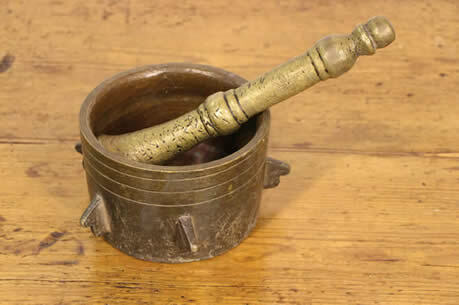 The pestle with turned rings and lots of patina. 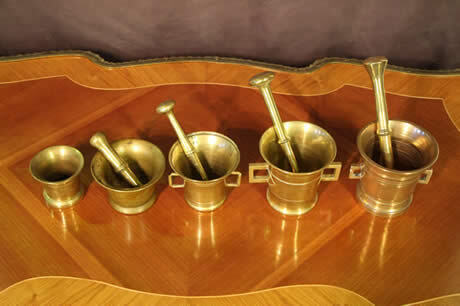 A collection of five antique brass or bronze mortars and four pestles. 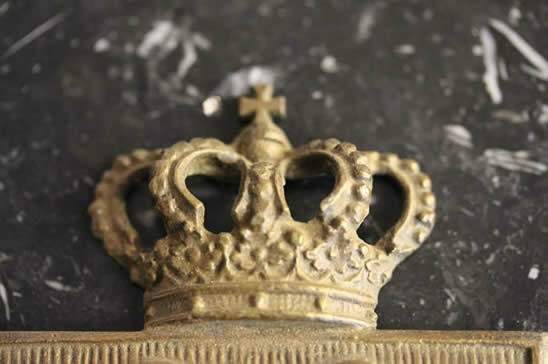 Each is unique and cast for quality production and has all the patina of an bygone era. three have lobbed cast handles and the other two of earlier design may well date from pre 18th century. 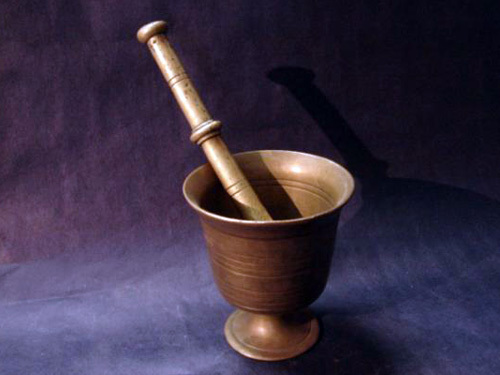 A large and heavy solid bronze mortar and pestle. the Mortar with cast locating lugs for heavy duty crushing in a stand. 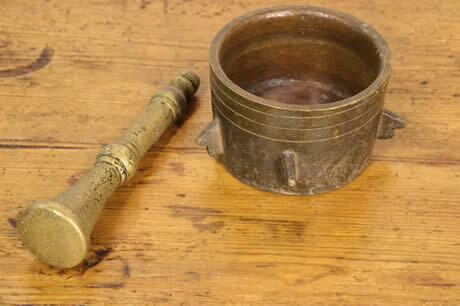 The pestle with turned rings and lots of patina. Very heavy lot at 5.5 kg the two. 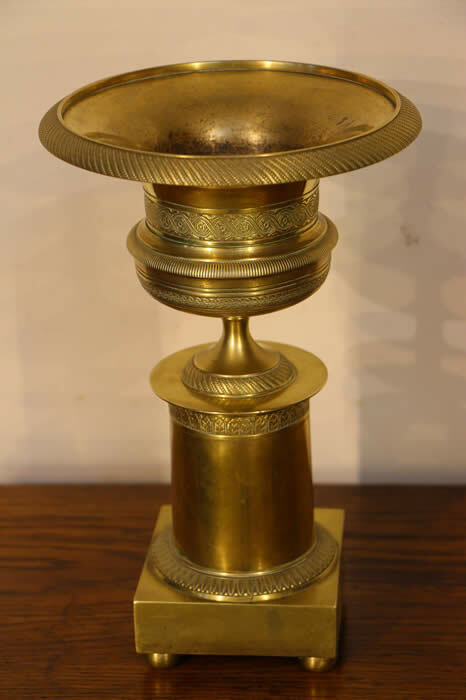 French antique Empire period brass urns of baluster shape with incised engine turned details to upper rim lip , waiste and base. Mounted by twin snake handles , perhaps aluding to an apothecary ownership? 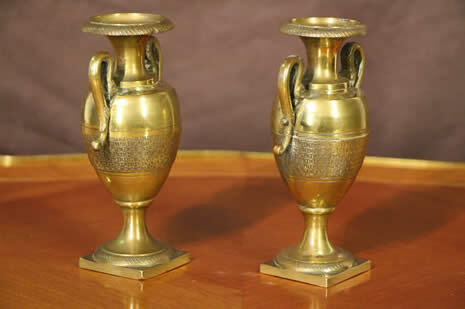 French antique Empire Style two handled urn or tazza with gilt bronze handles. 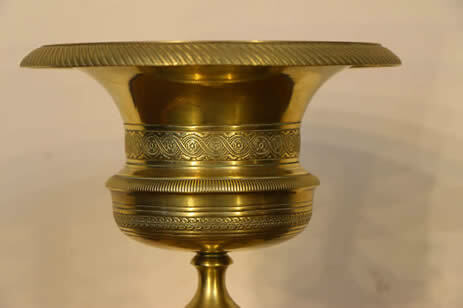 The engine turned dish sits on a finely turned moulded base and raised on a square plith adorned with a wreath. 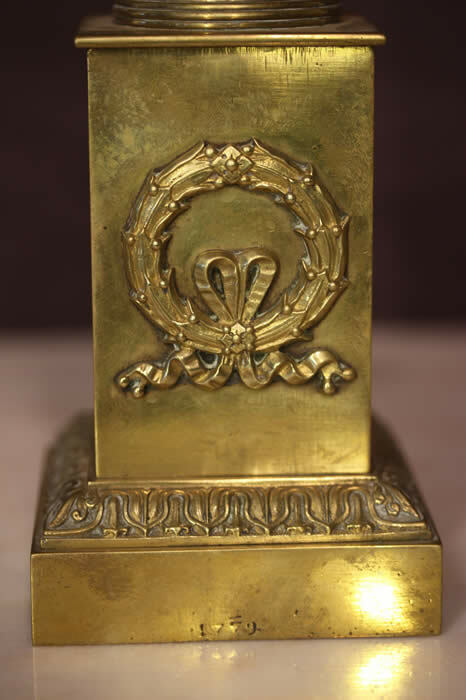 Mounted on an ornate stepped base and with a stamped impressed mark that reads as 1779. The wreath is mounted front on whilst the other three sides are plain. 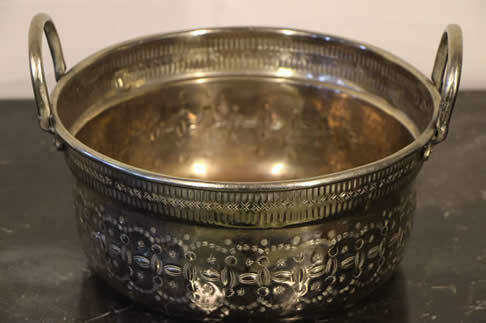 Original hand beaten solid brass caudron with applied design and with shaped lip. 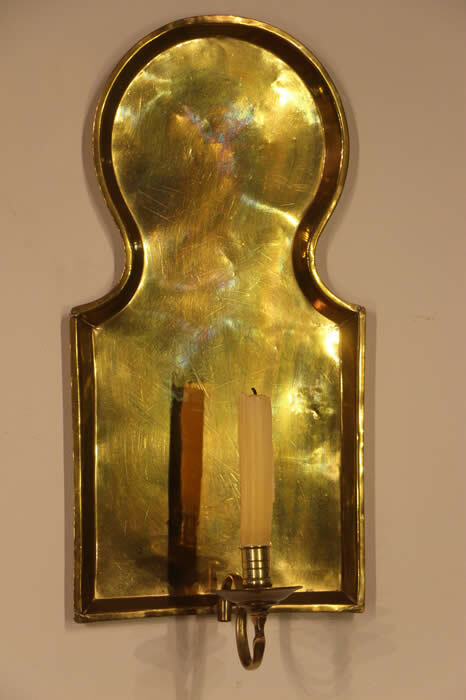 the solid brass handles applied with hot rivetts . 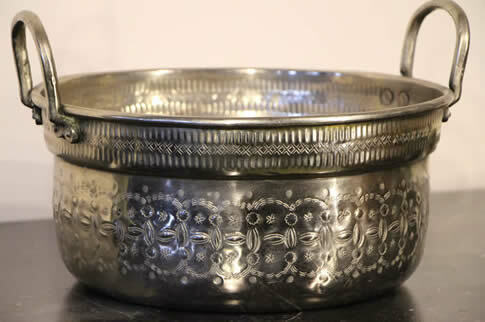 Perfect for a focus piece for the centre of a kitchen ladden with fruits and flowers. A large heraldic bronze of a double headed eagle on a shiled with crown and maltese cross above. 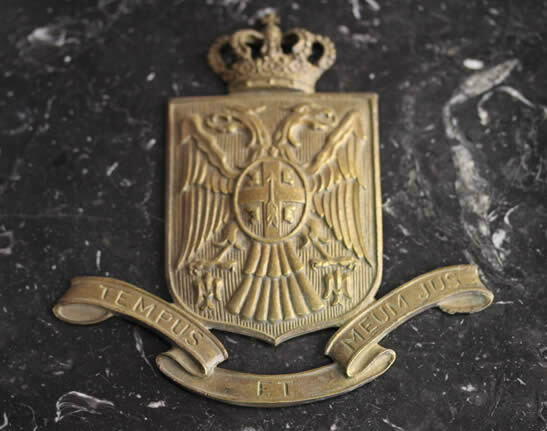 The shield is resting on a stylised ribbon banner that proclaims in Latin " TEMPUS ET MEUM JUS" the moto used by King Milan 1st of Serbia 1882-1889. 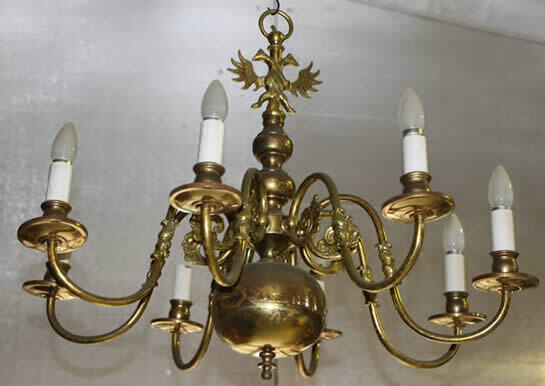 Large polished brass chandelier in the Dutch manner with double headed Austrian eagle top. Wired for electricity with 8 shaped arms. ideal for the french Provincial interior. Large size at 81 cm acress . height without chain or ceiling rose ( not supplied) is 62 cm! 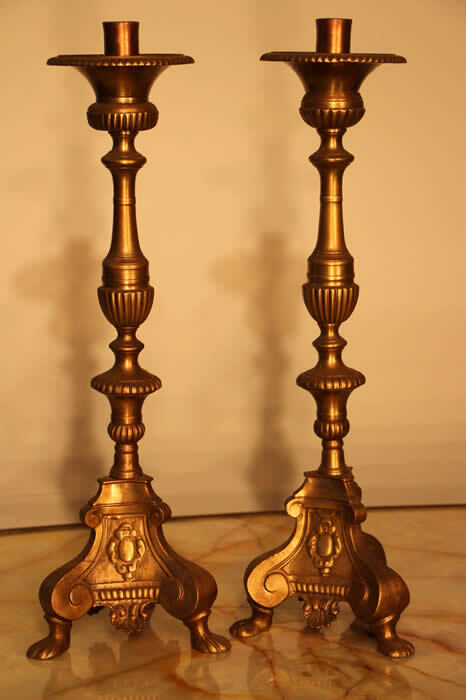 A good pair of heavy brass cast baroque style tall candlesticks. Good weight at over 3kg the pair. 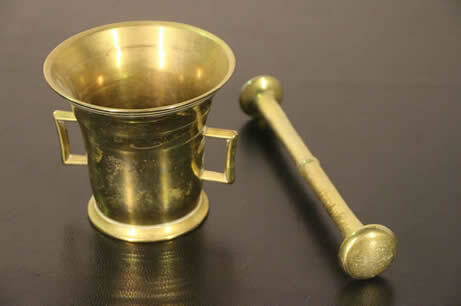 Description Victorian brass mortar and pestle with turned foot and ornamental turned decoration.